Like most people, I like my birthday celebration to last the entire month of my birthday. The good news is there are plenty of restaurants and places that will send you freebies to celebrate your birthday. Some are only valid for a week around your birthday, and others you can take advantage of the entire month. So, what are the best email lists and clubs to join so you have a month long birthday celebration? Get yourself a World Beer Tour card and start working your way through their extensive list of beers. Heck, even if you don't like beer, you'll get a FREE pizza for your birthday and a free appetizer when you sign up. One of my favorite places for a great sandwich, and you'll get a free 7in for your birthday. I recommend the Thank You Turkey which is like having thanksgiving leftovers on a sandwich available all year long. Join their Big Yellow Cup Club and get discounts on drinks when you bring in your plastic cup. Plus, perks for both your birthday and your Dickey's BYCC anniversary. Nothing's better than a Red Robin hamburger....actually, the only thing better is a FREE Red Robin hamburger for your birthday. You can't get their specialty burgers (aka Finest Burgers), but there's still plenty of amazing choices that you'll get for free on your special day. Again, free burger for your birthday. You can get any burger and even add bacon and cheese for no additional cost. It's number 5 in the list of "You're going to get fat this month" birthday freebies. The Sunbird restaurant has been through a variety of management and challenges over the years. Since they've changed to the Sunbird Mountain Grill and Tavern, the atmosphere is more casual and they've instituted a Loyalty program. After you sign up, you'll get a free meal for your birthday. It's a sweet deal and still an amazing view no matter what. I use this one every year. It's a free bowl of noodles - whatever you want. Add chicken, try something new, and fill yourself up with a free noodles bowl. Don't miss this one because they only give you a few weeks around your birthday. It's small, but a nice treat on a hot day. You'll get a free scoop of ice cream for your birthday after you create an account online. 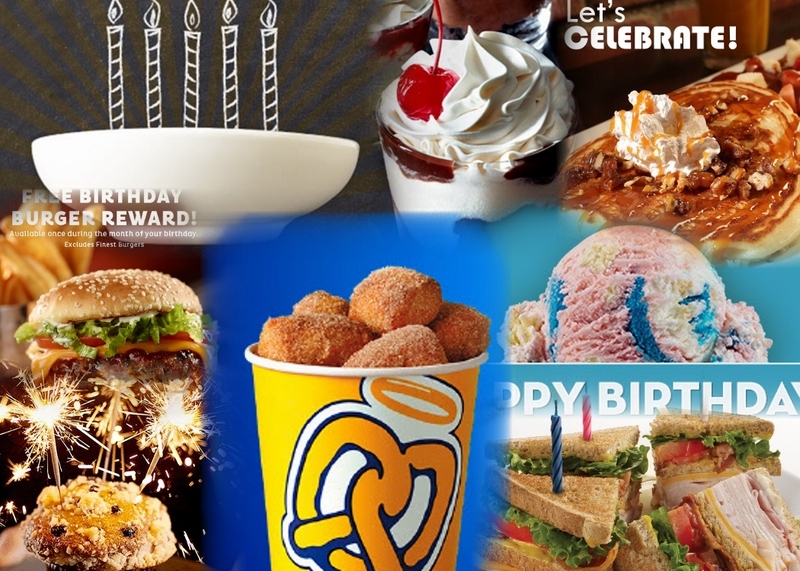 Sign up and download their app for a free pretzel around your birthday. $5 off your meal when you present your birthday coupon. If you've never been, their food is kind of pricey, but $5 off is a great way to try it for the 1st time. The next best is probably Starbucks which is a free drink for your birthday if you're a Starbucks Rewards member. These are my top choices, but there are plenty more with free desserts (after your purchase an entree) and other perks. If you want additional rewards for your birthday (that usually include a purchase of some kind), check out these other email lists: Taco Bueno, Applebees, Bj's Restaurant, Nosh, Dunkin Donuts, Famous Dave's and Panera Bread. Remember to read the fine print so you know what the coupons are good and not good for. Also, pay close attention to the expiration dates as some of them only last a few days. Most of all, enjoy your birthday month with these great Colorado Springs restaurants!